"Russia is ready. NATO sure ain’t! Oh, they have the numbers and they think they are strong. The truth is that these NATO midgets have no idea of what is about to hit them, when the Russians go to war these NATO statelets won’t even understand what is happening to them." Frankly, I am awed, amazed and even embarrassed. I was born in Switzerland, lived most of my life there, I also visited most of Europe, and I lived in the USA for over 20 years. Yet in my worst nightmares I could not have imagined the West sinking as low as it does now. I mean, yes, I know about the false flags, the corruption, the colonial wars, the NATO lies, the abject subservience of East Europeans, etc. I wrote about all that many times. But imperfect as they were, and that is putting it mildly, I remember Helmut Schmidt, Maggie Thatcher, Reagan, Mitterrand, even Chirac! And I remember what the Canard Enchaîné used to be, or even the BBC. During the Cold War the West was hardly a knight in white shining armor, but still – rule of law did matter, as did at least some degree of critical thinking. I am now deeply embarrassed for the West. And very, very afraid. And that is not the worst thing. The worst thing is the deafening silence, the way everybody just looks away, pretends like “ain’t my business” or, worse, actually takes all this grotesque spectacle seriously. What the (expletive deleted) is wrong with you people?! Have you all been turned into zombies?! WAKE UP!!!!!!! Let me carefully measure my words here and tell you the blunt truth. Since the Neocon coup against Trump the West is now on exactly the same course as Nazi Germany was in, roughly, the mid 1930s. Oh sure, the ideology is different, the designated scapegoat also. But the mindset is *exactly* the same. Same causes produce the same effects. But this time around, there are weapons on both sides which make the Dresden Holocaust looks like a minor spark. So now we have this touching display of “western solidarity” not with UK or the British people, but with the City of London. Now ain’t that touching?! Let me ask you this: what has been the central feature of Britain’s policies towards Europe, oh, let’s say since the Middle-Ages? That’s right: starting wars in Europe. And this time around you think it’s different? Does: “the best predictor of future behavior is past behavior” somehow not apply to the UK?! Let me also tell you this: when Napoleon and Hitler attacked Russia she was undergoing deep crises and was objectively weak (really! research it for yourself!). In both cases Russian society was deeply torn by internal contradictions and the time for attack as ideal. So I ask this simple question: do you really want to go to war against a fully united nuclear Russia? You think that this is hyperbole? The truth is that the situation today is infinitely worse than the Cuban missile crisis. First, during the Cuban missile crisis there were rational people on both side. Today there is NOT ONE SINGLE RATIONAL PERSON LEFT IN A POSITION OF POWER IN THE USA. Not ONE! Second, during the Cuban missile crisis all the new was reporting on was the crisis, the entire planet felt like we were standing at the edge of the abyss. Today nobody seems to be aware that we are about to go to war, possibly a thermonuclear war, where casualties will be counted in the hundreds of millions. Because the people of the West have accepted, or don’t even know, that they are ruled by an ugly gang of ignorant, arrogant psychopaths. Representative democracy does not work. The rule of law only applies to the weak and poor. Western values have now been reduced to a sad joke. Capitalism needs war and a world hegemony to survive. The AngloZionist Empire is about to collapse, the only open question is how and at what cost. The truth is that this is only the tip of a much bigger iceberg. In reality, crucial expert-level consultations, which are so vitally important between nuclear superpowers, have all but stopped a long time ago. We are down to top level telephone calls. That kind of stuff happens when two sides are about to go to war. 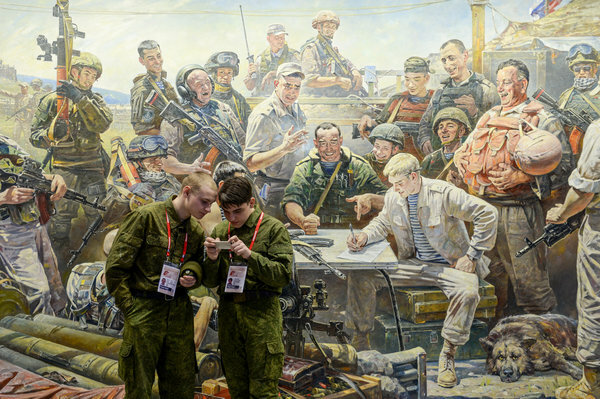 For many months now Russia and NATO have made preparations for war in Europe. And Russia is ready. NATO sure ain’t! Oh, they have the numbers and they think they are strong. The truth is that these NATO midgets have no idea of what is about to hit them, when the Russians go to war these NATO statelets won’t even understand what is happening to them. Very rapidly the real action will be left to the USA and Russia. Thus any conflict will go nuclear very fast. And, for the first time in history, the USA will be hit very, very hard, not only in Europe, the Middle-East or Asia, but also on the continental US. All that for what? The USA and Russia have NO objective reasons to do anything but to collaborate (the Russians are absolutely baffled the fact the leaders of the USA seem to be completely oblivious to this simple fact). Okay, the City of London does have a lot of reasons to want Russia gone and silent. As Gavin Williamson, the little soy-boy in charge of UK “defense”, so elegantly put it, Russia should “go away and shut up”. Right. Let me tell you – it ain’t happening! Britannia will be turned into a heap of radioactive ashes long before Russian goes away or shuts up. That is simply a fact. What baffles me is this: do American leaders really want to lose their country in behalf of a small nasty clique of arrogant British pompous asses who think that they still are an Empire? Did you even take a look at Boris Johnson, Theresa May and Gavin Williamson? Are you really ready to die in defense of the interest of these degenerates?! I don’t get it and nobody in Russia does. Yeah, I know, all they did is expel some diplomats. And the Russians will do the same. So what? But that’s missing the point! LOOK NOT WHERE WE ARE BUT WHERE WE ARE HEADING!! You can get 200,000 anti–gun (sigh, rolleyes) protesters in DC but NOBODY AT ALL ABOUT NUCLEAR WAR?! What happened to the West where I was born in in 1963? My God, is this really the end of it all? Am I the only one who sees this slow-motion train-wreck taking us all over the precipice? If you can, please give a reason to still hope. Right now I don’t see many. Don’t worry. There will be no war with Russia as there is no one to fight with. Russia could not even beat Ukraine when it did not have an army. It will simply fall apart like the Soviet Union did. Happy New Year and nice to see you around to this sleepy board. It must be the fresh air from the Odessa sea or the good care of your wife! I hope everything is fine with you.....and I am sorry for the delay to notice your post but there was a problem with the email of the site, which we didn't noticed, after moving the board back to the UK. Thank you! This is my army photo of 2016.